I have been discussing what new poker players need to know about cards used in brick-and-mortar casinos and some associated rules and procedures. Let’s get back to it. Strange things crop up in a poker game from time to time. But with decades of experience, events that are a complete novelty to a recreational player are old hat to the poker room management, and they have standard procedures in place for handling them. As I say, the casino will have in place strict protocols for handling each of these situations. I’m not going to try to explain them here, both because they may seem confusing and because they vary somewhat from one place to another. My goal here is only to get you to suppress the urge to argue that what they’re doing seems arbitrary or possibly even unfair. It’s best to just sit back, relax, and let the professionals handle it, trusting that they are following standard operating procedures. Even if it appears to inexperienced eyes as if they’re making it up as they go, they’re not, and there is a reasonably sound basis for what they’re doing. If you’re curious, feel free to ask the room supervisor to explain the procedure away from the table; most will be happy to fill you in. If this ever happens, don't play the hand! Alert the dealer immediately. An unexpected event that’s even rarer than those three is the phenomenon known as the “fouled deck.” That term refers to the discovery, during the play of a hand of poker, that the deck has too many cards, too few cards, or both a duplicate card and a missing card, the result of which is a bad deck with the right number of cards. 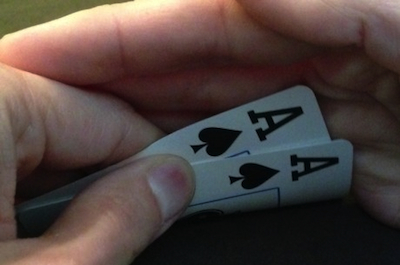 This is so rare that in six years of playing poker in casinos, I experienced it only once. I was in a tournament at Caesars Palace when I noticed that one of the cards had a different pattern on its back than the others, and was clearly from a different deck. The difference was unquestionably real, but was subtle enough that we had played with that deck for an hour before the error was spotted. I never learned whether, when tournament officials inspected the deck, it was found to have an extra card or not. Anyway, the reason I mention this is that, unlike the other three odd situations discussed in the previous section, this one imposes a positive ethical responsibility on a player who notices it. This would most likely occur by realizing that one of the “community cards,” i.e., those that the dealer puts out face-up on the table, is a duplicate of one of a player’s down cards. If this happens, you should immediately notify the dealer. Do not wait until the hand is over, because the entire action of the hand must be nullified, with all bets returned to the players. “Spading the deck” is the name for the procedure done by the dealer when a poker table is being closed down for the day. 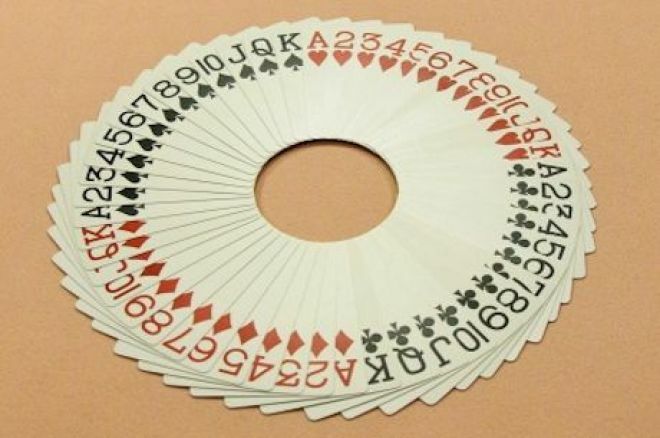 The cards are separated by suits, then each suit arranged in rank order, then the suits assembled in a specific order dictated by casino policy, but usually with spades on the bottom so that the ace of spades is showing when the deck is face up. 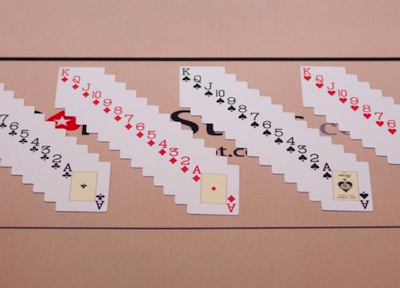 This is a security measure to ensure that the deck is complete, with no extra cards. When the deck is next put back into use, the dealer will spread them out on the table and scan through the cards, with the ordered deck making it easy to verify that all cards are present with no duplicates. This orderly way of storing the cards may be why many players falsely believe that when a “new” deck is brought to the table, it is new from the factory, rather than just being one of many in the poker room’s cabinet. Next week I’ll close out my discussion of poker room cards with some further thoughts on what it means to protect your hand.